Mockingbird Hill Park, 1962. Photo courtesy of Charlie Smith. Click for full version. As a Blue Grass Boy: Charlie Smith first started playing occasionally with Bill Monroe in 1956, while a student at Vanderbilt University. 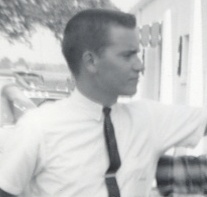 He was a regular Blue Grass Boy for about two years, from 1958 through 1960. He recorded one session with Monroe, which included the tune "Stoney Lonesome", cowritten by Smith and Monroe. He continued to be a frequent guest with the Blue Grass Boys for the rest of Monroe's life, playing twin fiddle on shows in Virginia and on the Grand Ole Opry. Before and After: Before joining Monroe, Smith played with the McCormick Brothers and with Connie and Babe. In the 60s, he played occasionally with Jimmy Maynard's Cumberland Mountain Boys, before moving to Virginia and joining the Potomac Valley Boys, later taking on leadership of the group. The Potomac Valley Boys were active for more than 25 years, recording two albums. In the 90s they began playing less but continued to regroup for occasional shows, including their 40th anniversary show in 2003.